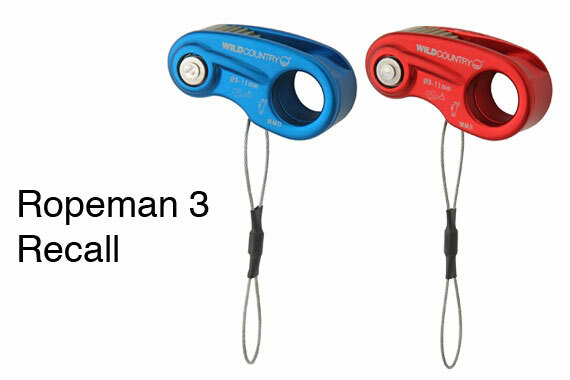 For the safety of all of our customers we are issuing an immediate recall of the Wild Country Ropeman 3. If you own a Wild Country Ropeman 3 please read this notice carefully and follow the instructions “How to Return the Product”. Our first priority is the safety of our climbing and mountaineering colleagues and customers, therefore we have taken the decision to recall the Ropeman 3 with immediate effect. We apologise for any inconvenience this may cause. Product not affected Please note the Ropeman 1 and Ropeman 2 are NOT affected by this recall. 1. To the retailer where you purchased the Wild Country Ropeman 3. 2. Directly to Wild Country Headquarters in the UK. 3. Directly to Outward Ventures. Contact Information – Please make sure you securely attach your address, your e-mail and telephone number to any unit returned.